Crayola’s Iconic 64-Crayon Box Was Introduced On Which Of These TV Shows? Which Empire Ruled Over The Largest Percentage Of Earth's Population? Among iconic products, there are few that can compete with the immediate recognition Crayola brand crayons have and few product packages are more universally recognized than the gold and green flip-top box they come in. While the company has used the gold and green color scheme since 1905 (the redesigned “Gold Medal” label No. 8 box), what truly differentiated the Crayola brand from its competitors was the release of the 64-color box with tiered crayon placement and a built-in plastic sharpener. The box was introduced in 1958, where it debuted on the set of the popular children’s television show Captain Kangaroo. 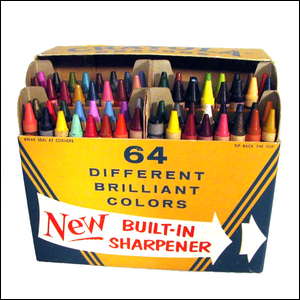 Although we can certainly attribute the immediate popularity of the new Crayola box to the significant audience of Captain Kangaroo, the enduring popularity of the box was definitely due to the way it solved the problems of previous crayon boxes—the new box had many more colors as well as a way to sharpen dull crayons to make them feel new again. Image courtesy of Kurt Baty/Wikimedia Commons.